Cemflow concrete helped renovate the Queens Pier at Portland in a £5 million scheme to revamp and increase berth capacity. 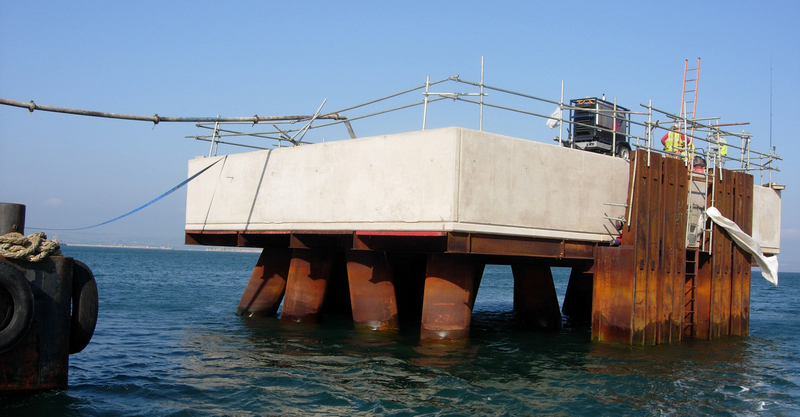 To improve the Queens Pier required the construction of two “Dolphins” to provide an extension to the existing pier and, as these new Dolphins would now be utilised for mooring vessels, the piers working life would also be extended. Each Dolphin sits on a number of steel cased concrete piles that are raked at varying angles. Each pile is approximately 11m deep and 1m in diameter. The top 5m of each pile is heavily reinforced which combined with access difficulties precluded the use of conventional compaction equipment. We proposed Cemflow V self-compacting concrete with a typical compressive strength in excess of 50N/mm2 at 28 days. Cemflow V flows under its own weight, without segregating and self compacts eliminating the need for compaction equipment. Cemflow V self-compacting concrete also complies with the requirements of exposure class XS3 as per BS8500 Part 1:2006 Table A.4 assuming a 50 year design life and a minimum cover of 45mm. The project was supplied in three pours totalling 140m3 during October and November 2011.